April 18, 2019 | 7:30 p.m. — 9 p.m. 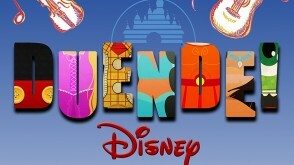 When you wish upon a star, your Duende dreams come true! Inspired by the timeless and reimagined classics from the Disney songbook and beyond, this musical, mouse-ical celebration features performances by the Bay Path Chorale, Page Singers, Dance Company, and Tone-a-Pathic. This spring, experience a whole new world of princesses, villains, and the sidekicks who love them!